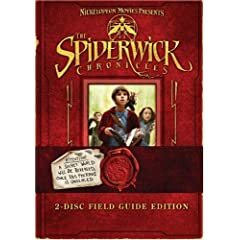 HOLLYWOOD, CALIF. – From the beloved, best-selling series of books comes the extraordinary fantasy adventure, The Spiderwick Chronicles, debuting as a two-disc Special Collector’s Edition DVD and Blu-ray on June 24, 2008. Bringing to life the fantastical, unseen world that exists all around us, The Spiderwick Chronicles is “an action-packed theme park ride” (Los Angeles Times) that is both “scary and wondrous” (Time). From the moment the Grace family moves into a secluded old house, peculiar things start to happen. Unable to explain the accidents and strange disappearances, the Grace children—Jared, Simon and Mallory—start to investigate and find the unbelievable truth of the Spiderwick Estate and the amazing creatures that inhabit it. Directed by Mark Waters (Mean Girls), the film features an all-star cast including Freddie Highmore (Charlie And The Chocolate Factory), Mary Louise Parker (“Weeds”), Sarah Bolger (In America) David Strathairn (Good Night, And Good Luck), Nick Nolte (Tropic Thunder) and the voices of Seth Rogen (Superbad) and Martin Short (Jiminy Glick In Lalawood). The Spiderwick Chronicles two-disc Special Collector’s Edition DVD and Blu-ray presentations boast multiple behind-the-scenes featurettes including a Making Of, a look at the cast and characters, “The Magic of Spiderwick”, “Spiderwick: It’s All True”, an exploration of the Spiderwick world and more, plus deleted scenes and a peek inside Arthur Spiderwick’s Field Guide. The Spiderwick Chronicles also will be available as a single disc DVD in full screen or widescreen.